Find out what our experts have to say about Yamaha Fascino! The least priced variant is Yamaha Fascino Darknight Edition priced at Rs. 60,682 and the most priced variant is Yamaha Fascino STD priced at Rs. 66,091. Choose the Yamaha Fascino which fits the bill of you. The Fascino is Yamaha's attempt at grabbing the style-conscious scooter market. The design of the Fascino clearly is a mix of classic and modern, and it looks just as good from the front as from the sides. The curvy design smoothly flows from the apron to the foot board to the grab rails and finally ends at the tail lamps. There are touches of chrome on the mirrors, horn grille, under the rider seat and on the rear just above the stop lamp. Fascino also features Yamaha's Blue Core technology, which improves acceleration and fuel efficiency. Because of this, the scooter promises a manufacturer claimed fuel mileage figure of 66 km/l. On the rear sides, there's the 3D Fascino logo along with a Blue Core badge announcing its harmonious relation with the futuristic technology. 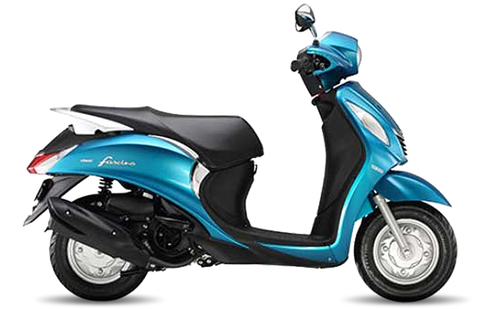 The Fascino is powered by a single-cylinder, air-cooled, 113cc, four-stroke engine producing a modest 7.1PS of power at 7500 RPM and 8.1 Nm of torque at 5000 RPM. The scooter measures 1815mm in length, 675mm in width and 1120mm in height. The wheelbase is 1270mm, seat height is at 775mm, and the ground clearance measures 128mm. The use of plastic-resin parts has helped in keeping the weight under check at 103 kg. The console flaunts a rich beige shade and houses analog speedometer and fuel gauge. The exhaust muffler and heat shield get matte black finish. The scooter gets dual telescopic front suspension, while rear wheel gets a sing unit swing suspension. There are 10-inch wheels, front and back, with tube-type tyres featuring silver cast iron rims. Braking duties are carried out by drum brakes on both ends. Under seat storage stands at 21 litres.